We want to cut from our land all of the firewood we burn in our woodstove, which is our only heat source. This year, that wasn’t a problem as we needed to cut down many trees to clear a right of way for our power line. We did have a problem of not having a place to put the wood once it was cut, so I decided we needed a woodshed. And since we wanted to save money on this project, I built it from mostly salvaged materials. Once I had most of the materials I was able to come up with a plan. I based the size and structure design of the woodshed on the roofing and framing materials I had obtained. The steel roofing was 10’ long and I had six sheets of it 26” wide. With a couple inches of overlap between the sheets, this meant the roof would be 10’x12’. In order to have a nice overhang on the roof to keep the wood out of the rain, I decided to make the shed itself 10’x6’-6”. 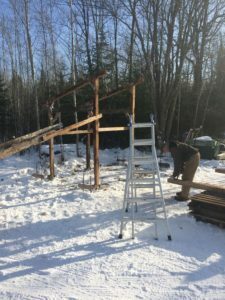 I wanted to make it a post framed structure since I’m interested in timber framing and this, while not exactly timber framing, would give me a little experience. I also had 4x4s which lend themselves to that framing style. So I decided to make 3 “bents” (to use the timber framing term for a flat section of framing which is later stood up during frame raising) with the shed roof profile and two posts. The construction itself wasn’t particularly difficult and I already owned all the tools I needed. When I started building the woodshed I chose a 3/12 roof pitch and used a speed square to mark the angle on the posts and cut them with a circular saw. I then used another 4×4 as the rafter on top of them. Into the two posts of each bent, I notched in and nailed on 2×6’s as a rafter tie. I notched the rafter tie in so that it would have a surface flush with the post in order to nail a 2×4 to them. This would function as a knee brace. After this, I cut some scrap plywood to use as gussets for additional stiffness. After I finished assembling the bents, I measured and marked where each post was going to go and placed and leveled the deck blocks. At this point the project was put on pause for a few weeks while other things took priority like getting electricity and a refrigerator and going deer hunting. 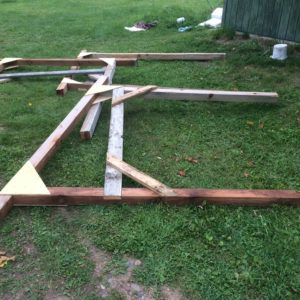 I got back to the project when my dad offered to help raise the frame. This could have been done by one person, but it’s a whole lot better with two and I also appreciated my dad’s construction expertise. We raised and leveled the first bent, then the second and attached them together temporarily while we raised and leveled the third. We then used 2x6s for beams to tie all the bents together permanently. After that, more 2x4s went on for roofing purlins followed by the steel roofing. 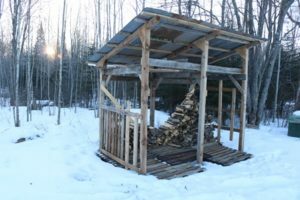 When we finished, the woodshed wobbled a little in the direction that didn’t have knee braces so the next day I added a couple 1x4s as braces across the back which stiffened it up nicely. I had originally planned on framing in a floor, but with winter coming fast I just placed pallets on the ground as a floor and stacked the wood on them. This seems to work just fine. Eventually, I plan to add some walls to have something better to stack wood against, but for now I just have some more pallets screwed to the posts which are effective, but not pretty and I suspect not long lasting. If I can do this you can too. 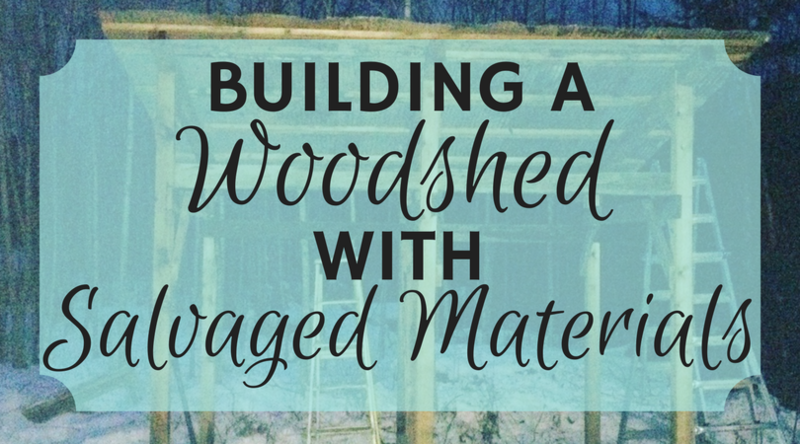 Just search for your materials and come up with a plan for how to turn them into a shed. Make sure to check local ordinances for permit requirements. Where I live this was under the size where a permit is required, but that size varies based on where you live. Ask for help when you can use it, not just when it is absolutely necessary. 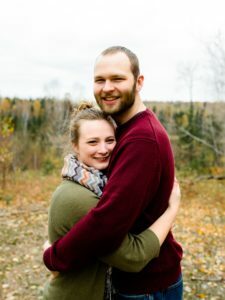 I was glad to have help with this project. If I were to do this project again I might make one bent for the front and one for the back with three posts each and no sloped angles rather than the three bents with the sloped beam for a rafter. I really enjoyed building this woodshed, mostly because I like building things, but also because I learned some things while doing it. This was the kind of thing we wanted more of in our lives when we decided to move here. I think this was a good project for someone at my skill level and I look forward to building more things and building my skills.